Sophisticated and modern, Bel Aire Bridal features sparkling headbands, hair combs and jewelry. Their beaded and lace-edged veils complement modern wedding fashions. 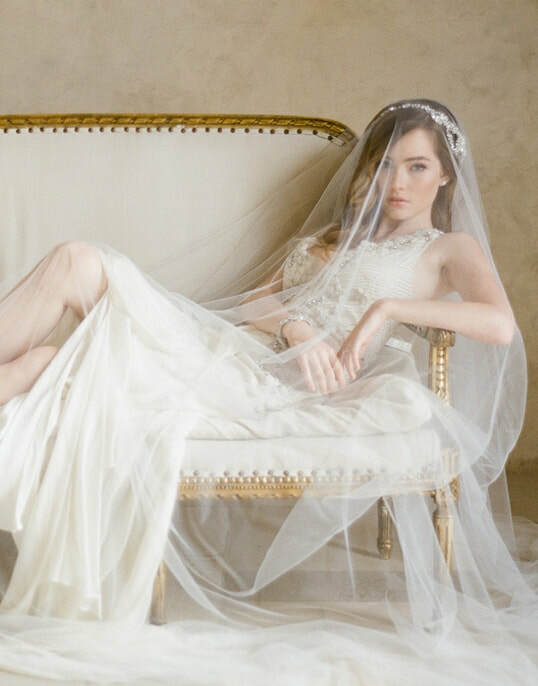 If you love drama, you'll love their opulent Cathedral veils! Richard Designs are unique and one of a kind, made in England just for you! This innovative collection is designed for the unique bride who loves a touch of vintage, a bit of color and a lot of romantic details. Finally, bridal jewelry that is stylish and sophisticated without breaking the bank. You'll find that perfect piece to complete your look...designed with you in mind, by David Tutera. brooches and more...the perfect accessories for your wedding day at a price that you'll love. Today's bride wants to show off her personal style! Consider adding a sparkling belt or capped sleeves to make your beautiful gown one-of-a-kind. The Bride's Shoppe has many options for you to choose from!